[Updated Feb. 22, 2019] June is Whale Month on RSR! * Rebutting the Canonical Whale Evolution Story: Real Science Radio host Bob Enyart begins a comprehensive series of interviews with filmmaker Carl Werner. 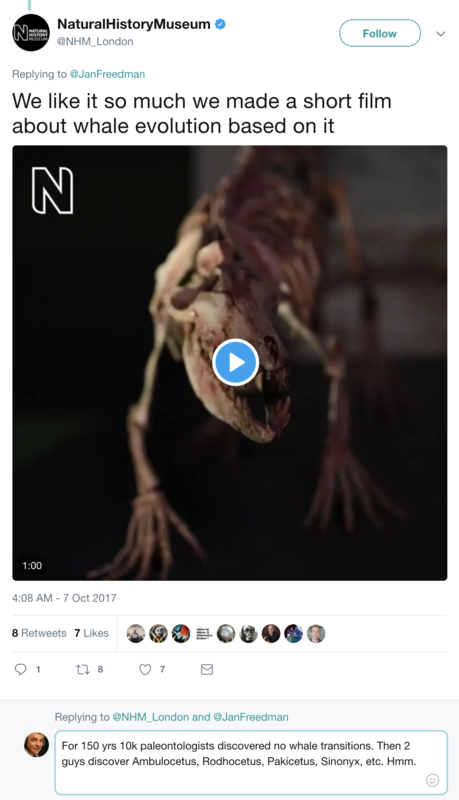 Dr. Werner's videotaped interviews with the discoverers of the "walking whales" have caused museums around the world to change their fossil exhibits. Dr. Werner reports on one of the most fascinating chapters in the history of science. 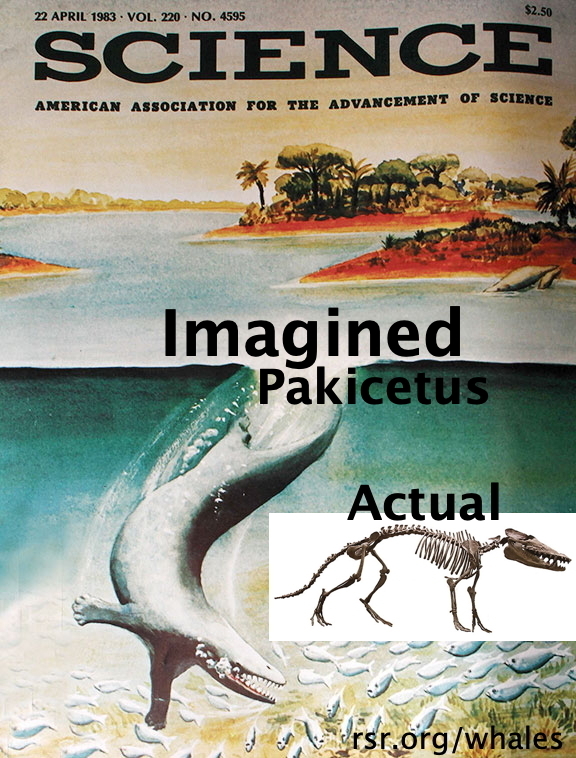 For the imagined whale-like features of creatures like Pakicetus, Ambulocetus, and Rodhocetus, one by one, are being falsified. Their "whale features" are being withdrawn by "whale evolution experts" and even by the discoverers themselves, the teacher Philip Gingerich and his former student Hans Thewissen. * RSR's List of Whale Evolution Problems: For the list itself, see below. * Filmmaker's Bombshell Report -- Forged Whale Fossils: Dr. Werner interviewed the scientists who supplied the primary whale evolution "fossils" to the world's leading museums including the Smithsonian, Carnegie, American Museum of Natural History, NHM of London, NMNS of Tokyo, Melbourne Museum, Canadian Museum of Nature, and the NHM of Paris. 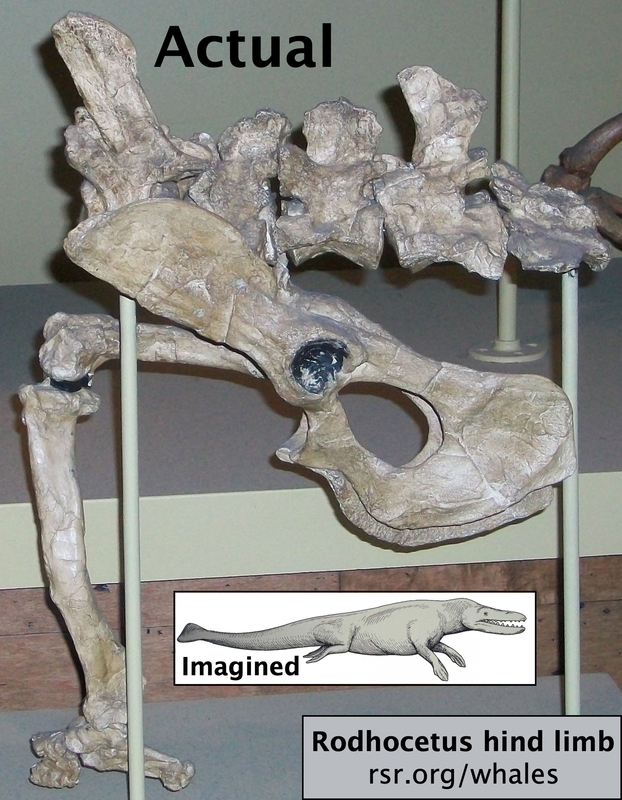 Gingerich now admits that Rodhocetus had no flippers and no fluked tail (and certainly no blowhole), so what millions of evolutionists believe regarding whale fossils is based on fabricated, and fully falsified, misinformation. Hear it, read the full press release, and see it for yourself below (rather than accepting the widespread Darwinist misinformation like about Rodhocetus from princeton.edu). 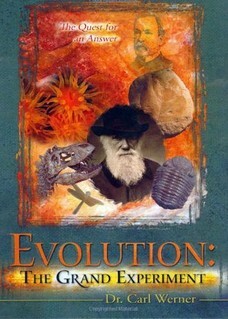 * Today’s Resource: You'll just love Carl Werner's Evolution: The Grand Experiment DVD and his Living Fossils DVD! Want something else? Just browse the Science Department in the KGOV store for the best of the best in creation books, debates, and videos, or just call us at 1-800-8Enyart (836-9278). * See this Gingerich Rodhocetus excerpt from Grand Experiment: The teacher and the student. First see this two-minute excerpt with Werner's interview with Rodhocetus discoverer Dr. Phillip Gingerich and then see the brief excerpt with Gingerich's pupil Dr. Hans Thewissen. * Whales are "Best" Fossil Evidence for Evolution: The Smithsonian Museum of Natural History's Curator Emeritus, the American Naturalist, the Annual Review of Ecology and Systematics, a Univ. of London Paleontologist, etc. are among the many evolutionists presenting whales as the best fossil evidence for Darwinian evolution. (Click for quotes & references.) Richard Dawkins says that "one of the best examples" of intermediate fossils "is whales." - The evolutionary tree based on the gene Prestin shows bats and whales "together rather than with their... evolutionary cousins"
- San Diego State's whale evolution expert Dr. Berta: "Rodhocetus [used] its fluked tail for propulsion through water..."
- Listing nine whale features, Thewissen, et al. 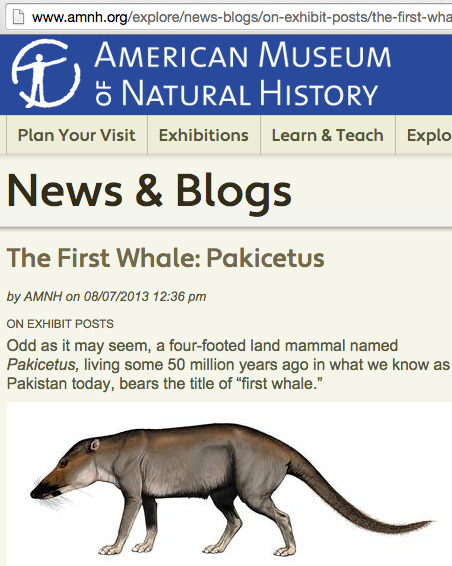 conclude in Nature, "Pakicetids display none of these [whale] features"
- Berkeley's Whale Evolution article says: "These first whales, such as Pakicetus, were typical land animals." - Dr. Gingerich explains that what "is similar between hoofed hyenas and the archaic whales are the teeth." - Howard University's whale fossil expert Prof. Daryl Domning: "this is nonsense... Hippos were very late on the scene"
- Gingerich's "problem" with hippos is that "they are all plant eaters; [but] whales today are all carnivores." - Science: "the teeth of... mesonychids, such resemblance is sometimes overstated and... represents ... convergence"
- Whale evolution believer and expert Dr. Berta regarding Ambulocetus refers to its "purported whale characters"
- Gingerich found Rodhocetus, Pakicetus, Synonyx and also Maiacetus ("mother whale") and Artiocetus! - So the dynamic duo found Rodhocetus, Ambulocetus, Pakicetus, Synonyx, Maiacetus, Artiocetus, and __________? - Timewise, whale "evolution" is being crushed in the industry-wide "big squeeze" as fossil finds continue to compress any time available for evolution. To not violate its own plot, the Darwinist story doesn't start animals evolving back into the sea until the cast includes land animals suitable to undertake the legendary journey. The recent excavation of whale fossils on an island of the Antarctic Peninsula further compresses the already absurdly fast 10 million years to allegedly evolve from the land back to the sea, down to as little as one million years, by this assessment based on various techniques that produced various published dates in 2016. While maintaining his evolutionary political correctness, Wayne Carley, the president of the Nat'l Association of Biology Teachers nonetheless observed, "The very day I viewed the segment “Great Transformations," wherein P. D. Gingerich firmly stated that whales evolved from wolf-like carnivores, he and several colleagues published a paper in Science (293: 2239) showing that, in fact, whales evolved from ancestral artiodactyls." P.C. aside though, 100,000 U.S. professors think intelligent design is a significant scientific alternative to Darwinism, half-a-million U.S. medical doctors say that God brought about humans, and 30,000 U.S. public high school biology teachers do not endorse Darwinism in class. * Calling on a Young Evolutionist at DU to Retract Whale Claim: At the University of Denver recent biology graduate Travis Barlock debated Worldview Academy founder Bill Jack. After the debate Bob asked Travis about his favorite transitional fossils example: whale evolution, whether he was aware that the discoverer of Rodhocetus has now recanted that the creature had flippers and a fluked tail? Barlock said he was unaware of that development and that if and when he confirmed this, he would of course stop using Rodhocetus as a favorite example of evidence for evolution. We are now calling on Barlock to retract his Rodhoectus claim. * With Sharks Too – The Evolutionist's Favorite Fossil: As illustrated above by the transitional whales fiasco, Dr. Werner points out that frequently, the evolutionist's favorite transitional form is the partial fossil. For obviously then, the Darwinist can imagine that the missing parts conform to his story. As another example of this, theistic evolution advocate Denis Lamoureux cites Acanthodians, supposedly the shark’s evolutionary ancestor. But a 2011 John Hopkin's University Press text, The Rise of the Fossil Fishes, one expert noted that "Acanthodians remain as one of the most enigmatic of all ancient fish groups, about which we have the least amount of anatomical knowledge", as quoted by Brian Thomas. * London's Natural History Museum Never Heard of rsr.org/whales: Apparently. Even as of February 2019! London Museum, meet RSR. Start at rsr.org/whales.